The importance of keywords in your SEO campaign should be pretty much a given at this point in time. Everybody and their mother understands that you have to use keywords throughout your website’s content in order to increase your web ranking. However, figuring out what keywords are the most effective for your brand is a whole different matter. Many companies make the mistake of using keywords that are too broad or basic. If you run a small local cell phone repair company, then you’re not going to rank very high for the keyword “smartphone” no matter how much effort you put into your SEO – you’re just not going to compete with major corporations such as Apple, Verizon and LG to name a few. It’s why we can’t emphasize the importance of using niche keywords, or long tail keywords, enough. The long tail keyword is a more specific phrase typically made up of four or more keywords. Because long tail keywords are generally more specific to your brand, they are easier to rank for. 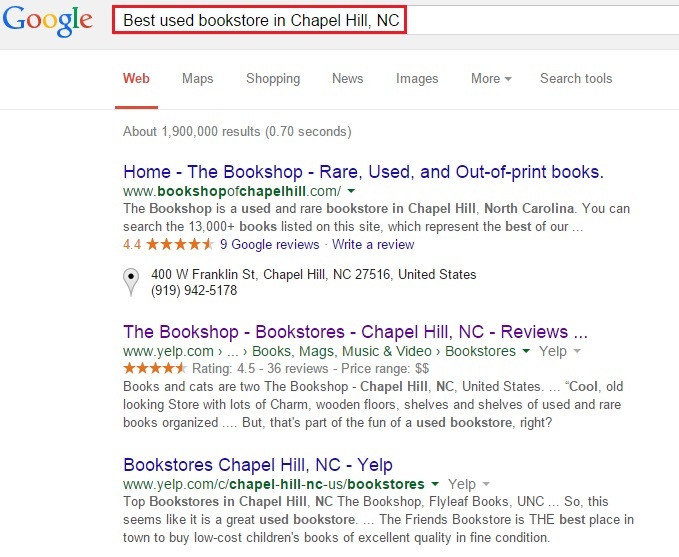 This is why you should consider using niche keywords as part of your long tail keyword. Niche keywords are highly specific to your industry. In order to be highly specific, they need to be long-tail keywords. In order to figure out what the most effective long tail keywords are, you’re going to need to do some niche keyword data mining. What exactly is keyword data mining? Basically, it’s keyword research done via the collection and analysis of the data that you’ve collected. Creating long tail keywords is much more difficult than creating regular keywords. There’s a reason why regular keywords are so difficult to rank for – everyone is using them because they are easy to think of and apply. Long tail keywords are much more unique to the brand putting them to use, making them easier to rank for, although tougher to come up with. Keyword data mining is an essential strategy for coming up with long-tail keywords as well as keywords in general. Keyword data mining is a fundamental step in the process of search marketing. It helps you to figure out what basic keywords you should be using for your brand, keywords that can then be used as the building blocks for your long tail keywords. You can use keyword data mining to judge the effectiveness of your current keyword use. This can be done by analyzing some of the data gathered by using a rank tracking tool like RankReveal. This information not only helps you to cut down on the use of poor keyword choices, but it will also give you a clearer direction of which long-tail keyword you should be focusing on. By doing keyword data mining, you’ll obtain a clearer understanding of your customer’s language. The data you obtained can tell you what type of language they are using by showing you which of your keywords are more effective at drawing web traffic and at converting visitors. By understanding how your customers are searching, you’ll have a better grasp of what language to use in order to reach your target audience. While you can probably differentiate between a normal keyword and a long tail keyword, it’s a good idea to know what the different types of keywords are so that you understand how they affect your content. Middle Tail Keywords – Middle tail keywords (aka, chunky middle search terms) typically consist of two to three words. They are not as competitive as head tail keywords but are not quite as specific as long-tail keywords. For example, “super bowl winners” would be a middle tail keyword. They tend to have more direction than head tail keywords but are still not well targeted and can be difficult to come up with content ideas for. 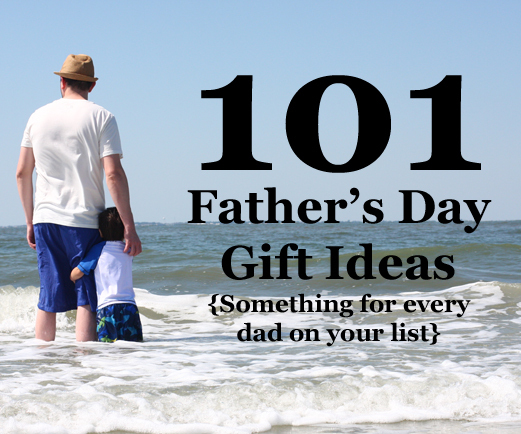 Examples of middle tail keywords also include “holiday meals,” “2014 World Cup” or “father’s day gifts.” As you can see, they manage to be more specific than head tail keywords but are still quite broad in their intention. These types of keywords work well for landing pages. Example of a middle tail keyword. Long Tail Keywords – These are the kinds of keywords that will attract your target audience. Not only will you rank better for long tail keywords, you’ll eliminate the poor quality traffic that head tail keywords and middle tail keywords can bring to your website. The higher the quality of traffic your website gets, the better your conversion rate will be. Long tail keywords also tend to reveal hidden information about your target audience, such as their interests, demography, geography and behaviors. 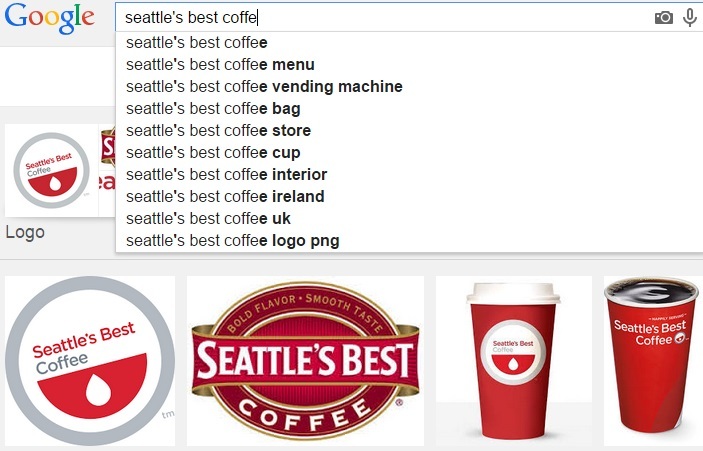 You can see this in the long tail keyword “Seattle’s Best Coffee Iced Vanilla Latte.” This keyword reveals a lot of information about your audience, including location and interests. 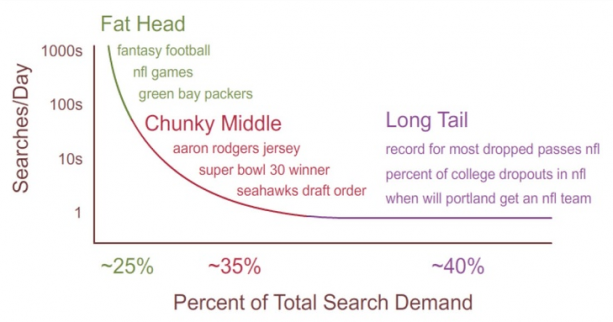 Long-tail keywords have much higher conversion rate than fat head terms. 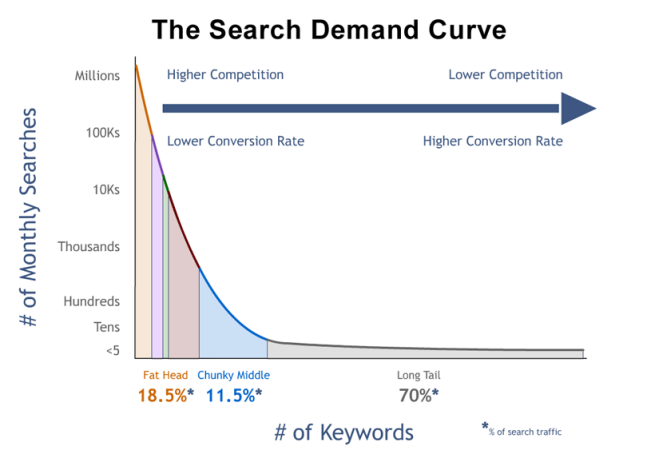 As can be seen from the diagram, although the fat head keywords have higher search volume than the long-tail keywords, the longer tail terms have a much, much higher conversion rate than the fat head terms. That means that although there is less traffic generated, there are substantially more sales and conversions with long tail keywords. While you can probably come up with some solid long tail keywords on your own, you’ll want to use keyword data mining in order to find more potential long tail keywords that can be even more effective. Use the following steps to find more high quality long tail keywords. Google Autocomplete Tool – All you need to do in order to use this tool is to type in a keyword into Google’s search bar. Google will automatically show a list of similar keyword suggestions. This is a great way to get long word keyword ideas. Google will automatically show a list of similar keyword suggestions. 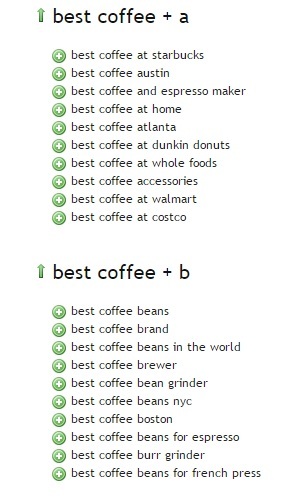 Ubersuggest – Simply type a keyword into their search bar and they’ll come up with thousands of keyword ideas that will be listed in alphabetical order for your convenience. Bing Keyword Research Tool – This tool will help provide keyword suggestions and ideas for your content. Although this tool is free, you’ll need to sign up for Bing Webmaster Tools. In addition to finding new long tail keywords to use, you’re going to want to make sure that the long-tail keywords you are already using are effective. This is where analytics come in. With RankReveal, you can find keywords that are ranking extremely low even though you’ve optimized your page properly for that keyword. This may mean that it’s simply not effective, which means you should consider using a different niche keyword. You should also look at bounce rates – which is the frequency at which visitors leave certain web pages. Check to see what the targeted keywords are for pages on which the bounce rates are particularly high. There’s a chance that you’re either offering irrelevant data for your niche keyword or that you are targeting the wrong niche keyword altogether. Another valuable place to retrieve data about your niche keywords is through your internal search engine. You can look at the search data in order to identity any valuable niche keywords that you are missing out on or even identify pages that have been optimized for the wrong keyword. The data you mine from your internal search engine can help you better optimize your webpages with more effective niche keywords. You can learn a lot from your competitors, including what keyword strategies are not working for them. Again, you can also use RankReveal in order to see what niche keywords your competitors are using on their web pages and how they are ranking for them. The niche keywords that they are ranking well for could also be the long-tail keywords that you want to optimize for as well, in order to make your niche keyword strategy more competitive. Once you’ve developed a list of strong long term keywords and have optimized your webpages for them, you’ll want to keep track of their performance. This can be done through the RankReveal tool, which is unique among keyword tools in that it allows you to type in a domain name instead of a specific keyword. The tool will then display all of the keywords being ranked for on that website as well as a ton of other useful information, such as how many keywords are ranking in the top 3, the top 10 and the top 100 as well as how many keywords are trending upwards or downwards. Additionally, it will tell you how many keywords your website is tracking for and how many potential keywords you are tracking for – and it will list all of those keywords along with detailed information such as their rankings. This kind of information is vital to monitoring the performance of your niche keyword, or long tail keyword, strategy.